VTI Instruments offers the EMX-70XX series of precision programmable resistance modules. These PXI Express (PXIe) modules have two or four independent channels. VTI Instruments EMX-70XX Series PXIe Programmable Resistor Modules allow the behavior of resistor-based equipment to be reproduced by controlling a series of relays that vary the resistance of each channel. They are designed to be deployed on applications such as RTD simulation as well as other resistance sensors, ATE calibration, potentiometer simulation, etc. All EMX-70XX series modules are equipped with four independent channels of programmable resistors, with four decades per channel. Each channel is equipped with its own sense leads for feedback. Two or four channels can be connected together and programmed to function as a potentiometer. These modules can operate in parallel and in series. Connecting two or more channels in parallel increases accuracy and reduces step size. Their connection in series increases the resistance range. The EMX-7004 module has an accuracy of up to ±0.02% of the programmed value ±0.5 Ω for any resistance value between 1 Ω and 16.383 Ω. It can be adjusted in increments of 1 Ω, either via the software application programming interface (API) or via the supplied software front panel. The EMX-7005, EMX-7006 and EMX-7007 modules are designed for applications with higher resistors. They offer an adjustable resistance range from 163 kΩ to 16 383 MΩ. These four cards have a nominal power of 0.5 W and a thermal offset of less than ±25 μV. EMX-7014, EMX-7015 and EMX-7016 modules are also available for applications with lower accuracy requirements. 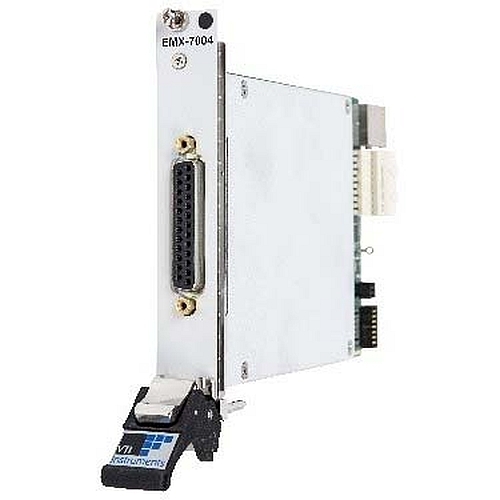 IVI-COM, IVI-C and LabVIEW drivers are supplied with EMX-70XX series modules.